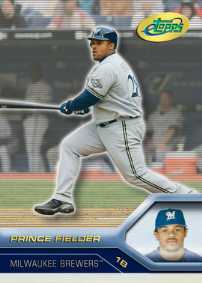 Topps announces it is offering its first Rookie Card of highly touted power-hitting prospect Prince Fielder. The card is currently being offered on eTopps.com and will be available through Monday evening. The Prince Fielder Rookie Card, which is limited to just 2,000 copies, can be had for $6.75. Along with Fielder, eTopps is offering 5 other top MLB rookies including phenom Jeff Francoeur of the Atlanta Braves (2,000 copies), Conor Jackson of the Arizona Diamondbacks (1,500), Zach Duke of the Pittsburgh Pirates (2,000), Dan Johnson of the Oakland A's (1,000) and Jeremy Hermida of the Florida Marlins who hit a grand slam in his first Major League at bat. All cards are available for $6.75.